More than a quarter of a million Burundians have fled to neighbouring countries since April 25, 2015, most of them to Tanzania. Nduta refugee camp is located in north-western Tanzania and can barely provide shelter, latrines and showers to every refugee. The Security Council will dispatch a senior United Nations envoy to consult with officials in Burundi to “find a way forward on all issues related to peace and security and UN activities in the country,” after the Government earlier rejected a Council resolution on establishing a police officers’ component there and amid reports that it will withdraw from the International Criminal Court (ICC). Briefing reporters today after closed-door consultations with the Security Council, Jamal Benomar, the Special Adviser to the Secretary-General for Conflict Prevention (including Burundi), said he had discussed implementation of its resolution 2303 (2016), which authorized up to 228 UN individual police officers for the component, to be deployed in the capital, Bujumbura, and throughout Burundi, for one year. Mr. Benomar said Burundians proved this themselves a decade ago, when they emerged from a long civil war that saw hundreds of thousands of people killed and displaced. “With the support of the region and the international community, Burundian stakeholders worked together then to come to an agreement that provided a sound framework for a stable future.” In the years that followed, Burundi made important strides towards peace and development. 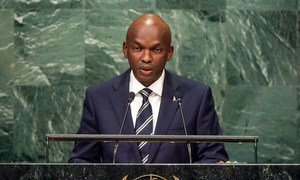 As an important contributor to UN and African Union peacekeeping troops, Burundi itself helped other countries to find stability, he noted. “Burundi’s future rests in Burundi’s hands. I am confident that with political will and leadership, the Burundians can find a way out of this crisis through dialogue and compromise,” he said. Responding to questions, including whether he would raise the issue of the country’s reported decision to suspend cooperation with UN human rights officials and also to withdraw from the ICC’s founding Rome Statute, Mr. Benomar said he hoped to discuss all issues on the table. “What we need is a renewed engagement with the Government with a view to clarify the objectives of the resolution and cooperate on finding a way forward on all issues related to peace and security and UN activities in the country,” he concluded. Further, Mr. Dujarric said that while he had heard reports of the Burundian Parliament voting to withdraw from the ICC and a letter reportedly being sent to the UN, no such letter had been received as of today indicating their decision. “Obviously, if a letter were received, it would be regrettable, but I think it’s also important to note that, according to the provisions of the Rome Statute, such a decision would become effective one year after notification, he said, explaining that State parties that decide to withdraw are still obligated to cooperate with any criminal investigations or proceedings that were commenced before the effective date of the withdrawal. Burundi was thrown into crisis more than a year ago when President Pierre Nkurunziza decided to run for a controversial third term that he went on to win. To date, it has been reported that hundreds of people have been killed, more than 250,000 have fled the nation, and thousands more have been arrested and possibly subjected to human rights violations. Burundi has rejected deliberately politicized or falsified reports on the human rights situation in the country and will produce a comprehensive survey on the issue in response to a recently-released United Nations-backed inquiry, its Minister for External Affairs told the General Assembly today.